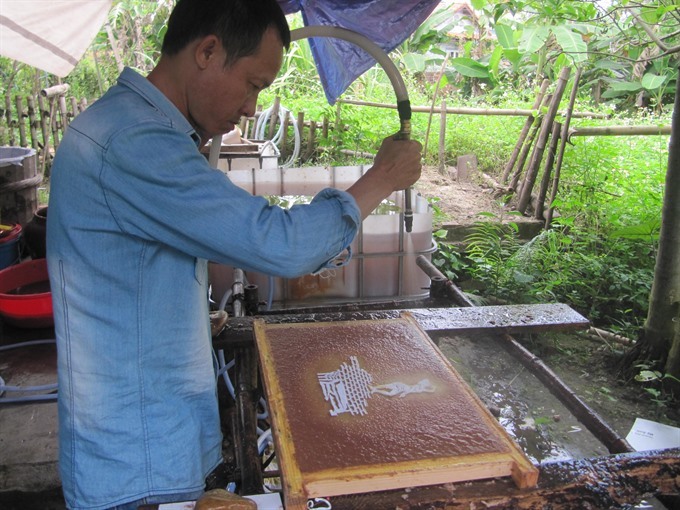 Trương Tấn Thọ, 39, earns a living making traditional paper. Apart from the famous dó (poonah) paper, his firm in Hoi An City, called Giấy Việt (Vietnamese paper), also makes paper from the pulp of bamboo and mulberry trees. A few years ago, Thọ hit up on the idea of using the stems of the nipa palm (called water coconut in Viet Nam), found in profusion in the area, to make paper and paper products, using the know-how he had acquired in making traditional paper with local materials. 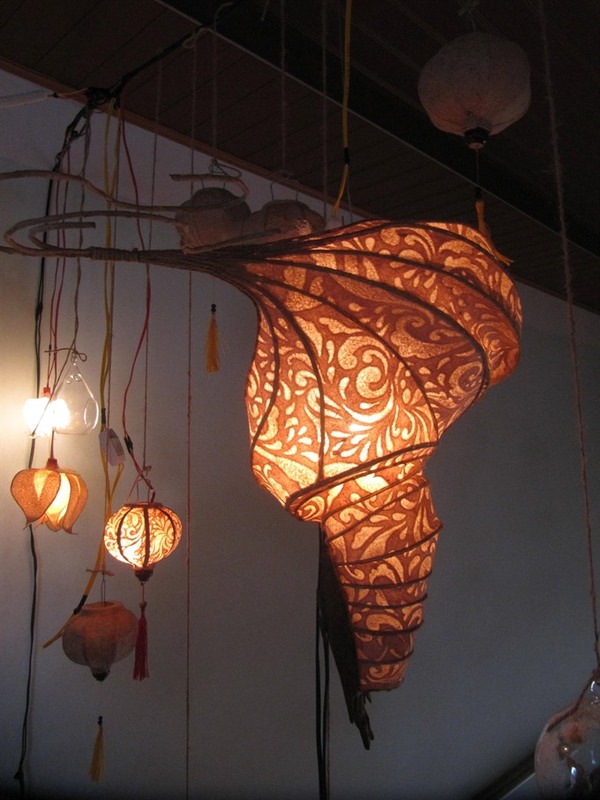 It took him two years to find a formula and method that worked, but he has since been able to create paintings, lamp shades, hand fans and wall hangings that are not only beautiful, but also have the added attraction of using locally-grown materials. Basically, the process goes like this: the trunks of bamboo, mulberry trees and stems of nipa palms are boiled for hours and then ground to a powdery consistency. Wooden frames with voile screens and cutouts of designs or pictures are dipped into this mixture, taken out and sprayed with water in varying degrees of force to shape and design the powdery substance on the surface. Once this is done, the cutouts are removed, creating beautiful patterns, designs and pictures. The frame is then dried in the sun for several days. What makes this art different is that the paper is not painted upon, patterns and pictures are “embossed” on to it. Thọ, a native of Quảng Nam Province, had first begun his paper business in HCM City before setting up the Giấy Việt “garden” on Nguyễn Duy Hiệu Street in Hội An City with some partners. 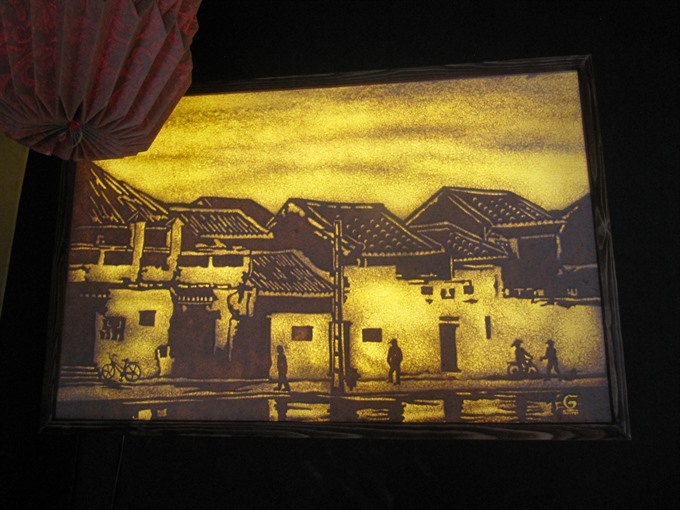 “Creating art on nipa palm paper is a new style. I want to tell the story of Hội An using this palm that is a well-known feature and attraction among visitors to Hội An,” Thọ said. 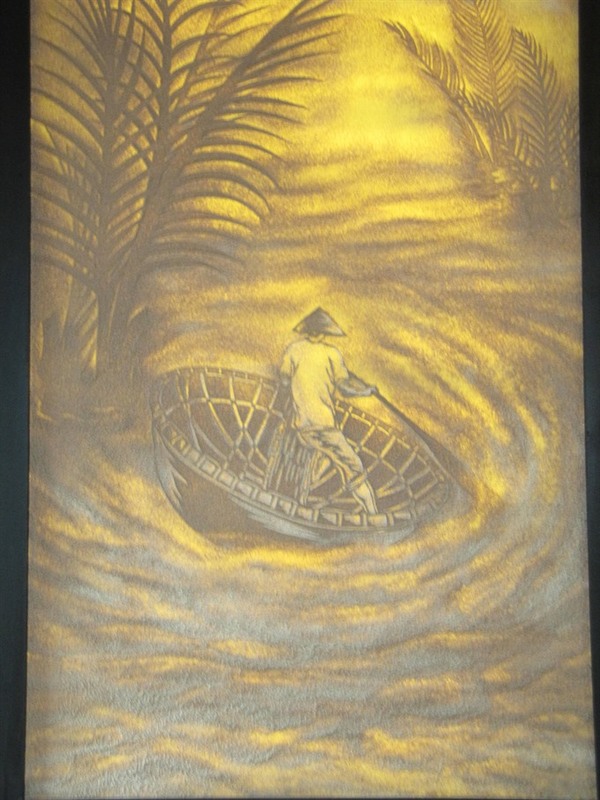 “While bamboo and mulberry have been used by papermakers in Việt Nam before, the ‘paintings’ created on nipa palm is unique,” he claimed. 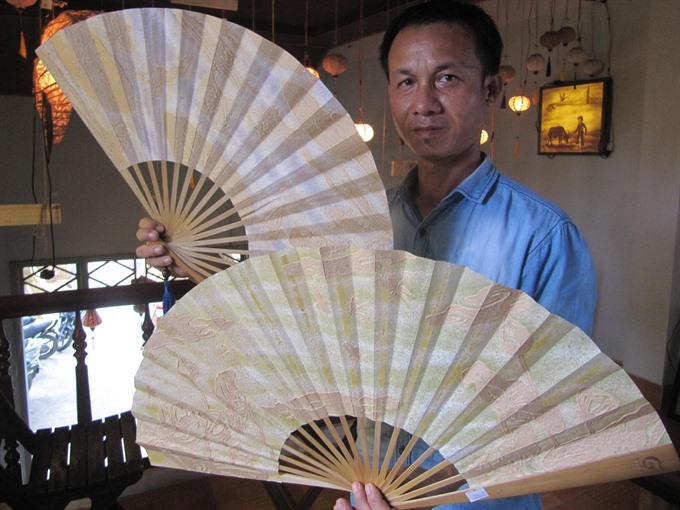 He said the nipa palm artworks only used rotten or pruned stems from Cẩm Thanh Commune – home to the largest nipa palm forest, 5km from Hội An, so it does not harm the environment. “Strong or soft sprays will create dark or light colours on the brownish colour of the nipa palm pulp. It’s a secret skill that I found while creating artworks with different material for years. “It seems to be a quick process, but it is a time consuming process to get an idea and lay out a story. We make and break stuff many times before completing the process of making an artwork,” said Lê Thanh Hà, Thọ’s partner in the Giấy Việt garden. “We have demonstrated this art at a workhop in Đà Nẵng held to introduce local crafts to tourists,” Hà said. “Nipa palm pulp can be used for mass production of souvenirs in Đà Nẵng and Hội An, giving visitors greater choice of gifts by both cities,” he dded. He said the nipa palm paper can be used for interior decoration items including lanterns, hand-fans, postcard, partitions and origami works. Thọ said the process needs a lot of sun, so work is often suspended or delayed during the rainy season between October and April. He said a “painting” takes them at least two days to finish, however, ideas and layout would need months to create. Thọ also said the art of nipa palm paintings and artifacts would add another souvenir for Hội An, and promote Cẩm Thanh as an ecotourism site. In March, Thọ and his partners completed a nipa palm painting of Polish archaeologist and architect Kazimierz Kwiatkowski, known as ‘Kazik’, when Hội An and the Embassy of Poland in Việt Nam marked the architect’s 20th death anniversary. The portrait of Kazik was presented to Polish ambassadress Barbara Szymanowska. It was made to pay tributes to the Polish architect, who made major contributions to promoting Hội An and Mỹ Sơn as the two first world heritages in Quảng Nam, as also the Complex of Huế Monuments in Thừa Thiên-Huế Province. Thọ and his craftsmen have been creating portraits of the red-shanked douc langur – Đà Nẵng’s biodiversity mascot as it hosts the Asia Pacific Economic Co-operation Summit (APEC) in Đà Nẵng, landscapes of the Sơn Trà forest, the city’s white beaches, and the Ngũ Hành Sơn (the Marble Mountain). “Nipa palm has been around in Cẩm Thanh for several centuries, and it has become a symbol of the most popular ecotourism site in Hội An. That’s why I wanted to promote the image of the ancient town through a palm that it is already identified with,” he said.